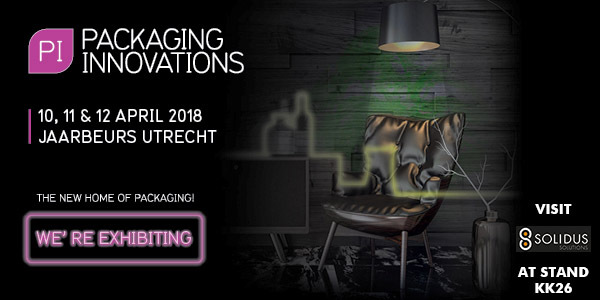 SOLIDUS SOLUTIONS will be present for the first time at Packaging Innovations on Tuesday 10, Wednesday 11 and Thursday 12 April. It will present, among other things, some innovative packaging solutions for industrial applications. Two products that Solidus presents during the fair are Bag-in-Box and slip sheets. Our Bag-in-Box system has been developed for the use of engine oil in car service garages. In addition, our slip sheets are an excellent and inexpensive alternative to pallets in industrial and logistical environments. Slip sheets from SOLIDUS SOLUTIONS are thin, high-quality solid board sheets that are suitable for replacing any size of pallet. Our slips sheets are made to replace the traditional wooden pallets during transport. There are several advantages associated with the use of slip sheets: up to 10% more space in a container, less CO2 emissions, less weight and less use of containers. Our slip sheets are usually provided with edges on four sides so that the gripper of a push and pull attachment of a forklift can clamp the edges without causing damage. The edges run along the length of the sheets and protrude slightly. If the forklift truck is equipped with roller forks, you can use slip sheets without edges. SOLIDUS SOLUTIONS, in collaboration with Mobil Den Hartog and KwikFit, developed the innovative Bag-in-Box system for the use of motor oil in car service garages. With the system, garage owners will receive a more efficient oil stock management with a more favorable environmental performance. The Bag-in-Box system consists of a 20 liter plastic bag with a tap and around it a recyclable FSC solid board packaging. The special construction of the box was developed by SOLIDUS SOLUTIONS and provides an oil residue in the bag of less than 0.5%. After the oil has been used, the solid board packaging and the plastic bag can be disposed. With the Bag-in-Box, the garage owner no longer has to store oil in bulk quantities because the concept covers all car brands and models with different types of oil in one rack. The use of smaller plastic vials with motor oil is thus avoided and inventory management becomes more efficient and better. The Bag-in-Box system has already been successfully used in almost 300 car service workshops in the Netherlands. Would you like to have more information on Packaging Innovations? Go to http://www.easyfairs.com/nl/packaging-innovations-2018/packaging-innovations-2018/exposanten/deelnemerslijst/stand/660154/. It is possible to get a free ticket by registering on https://registration.n200.com/survey/3uc7t8u5zov1s?actioncode=NTWO000068KBD. We look forward seeing you on our stand KK26!